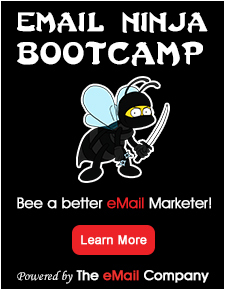 The newest addition to our blog roll has more than just years of experience in eMail marketing going for him. He’s got personality style and lots of insight to offer and his Gravatar is one the better webcam pics I’ve seen – I’m always left with the impression that he’s about to conjure some kind of hocus-pocus when I see it. DJ Waldow is the Director of Community at Blue Sky Factory, an ESP based in Baltimore. With over 4 years of experience in eMail marketing, DJ is active in the twittersphere (@djwaldow), on blogs (blog.blueskyfactory.com), and in the social media space. He’s an administrator and regular contributor to the Email Marketers Club and other eMail-related social networks. DJ resides in Salt Lake City, Utah where he can be found thinking, eating, and breathing eMail. 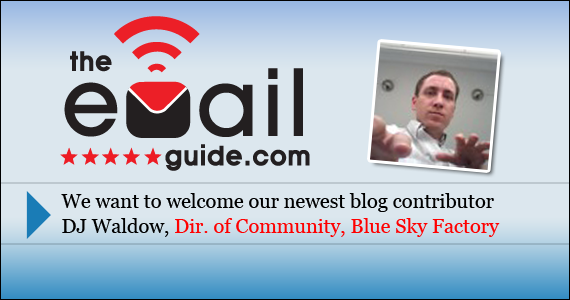 DJ, coming online as one of our regular contributors is just another indicator of how fast we are growing here at The eMail Guide! Welcome aboard DJ! Welcome aboard…we are looking forward to your posts. You have some great observations there too. Thanks, Jim … and The Email Guide. Very happy to be here! Glad to have you on the team DJ!